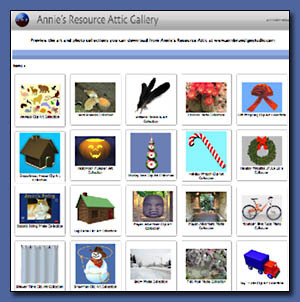 Annie’s Resource Attic Gallery is a new feature of this website that will give you a sneak preview of clip art and photo collections before you download them. Many of the activity sets include collections of original art, photos, or both from the activities that you can download in zip format. With this new gallery, you can review the individual images in each collection. You might discover some useful collections you had not known were available, because they belong to activity sets that are not on the same academic level as your students. Besides the link to the gallery on this page, there’s a gallery link at the end of the description of each art and photo collection. Art and photo collection links are always last on an activity main page, under Downloads – Resources, and have a short description ending with the gallery link. This new gallery is not intended to replace the download links. You might be able to grab a single image from the gallery, but there are no download buttons. Instead, click the gallery link, find your collection and review it, then close the gallery and download as usual. When you open the gallery, the home page has a thumbnail image for each collection. Hovering your cursor on these thumbnails will tell you the number of photos it contains. Click to open a collection, and you will see thumbnails of the individual images, fifteen to a page, plus thumbnails of any subfolders. You can view an individual image full size by clicking on its thumbnail. You also can run a slideshow of the images in any collection or subfolder. Slideshows of some collections are of interest only to you potential authors, as materials to build more activities. Students would not be entertained by a slideshow of snowman parts, for example! But some of the collections make good slideshows apart from the activities they came from. Examples include the tide pools, spring flowers, farm animals, Mayan jungle, and snow photo collections. These could be used as conversation starters before, during or after doing the related activities. Enjoy your first tour of Annie’s Resource Attic Gallery with the link below, and keep it in mind as a preview tool whenever new collections are posted! Subject area: Photos, clip art. Annie’s Resource Attic Gallery link: Click Here! The link will open the gallery in a separate tab. When you are finished, close the tab and go back to the activity page in Annie’s Resource Attic. There are also links back to the Attic in the title bar and instructions in the gallery.